A new Need for Speed: Hot Pursuit title is bound to get some attention, but more than two million downloads of the demo in two weeks? That's a huge number, and EA has more where that came from. Two million demo downloads in two weeks is quite impressive indeed, and I was right there with the rest of the eager early drivers, enjoying the sweet combination of developer Criterion Games' Burnout experience married with EA's oldest racing franchise. 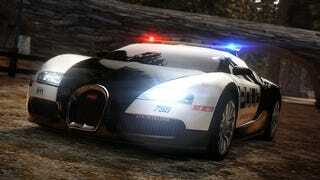 Over the course of the past two weeks the demo generated more than 700,00 posts to the Speed Wall, part of Need for Speed: Hot Pursuit's integrated social networking experience. Friends played more than five million Autolog recommended matches online, covering 54 million miles of road. It was a record two weeks for the police as well, with more than 20 million busts made. Sounds like they all hail from Roswell, Georgia. With less than a week until the game's November 16 launch, Need for Speed: Hot Pursuit is already the highest rated game in franchise history. So who's up for a little racing next week?